To identify a breaker that has been “tripped” may vary slightly but they all work the same way. The breaker in question will be loose and resting between the on and off position. in most cases you will see an orange or red indicator on the breaker. Breakers will trip by design when there is an excess of current passing through the circuit. 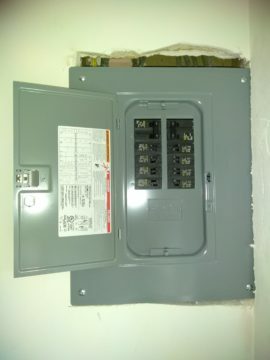 When the current passing through is more then the breaker is rated for the breaker will trip and turn off the circuit to protect the equipment connected from being damaged. Also if there is a damaged wire and the exposed wire is shorting out this will cause the breaker to trip. 2. Now, keeping your figures on it, firmly push to the “On” position. You should have successfully reset your tripped breaker. If it trips again, there may be an uncleared fault or overload condition. Make sure that the equipment you have plugged in doesnt have an amp draw that is more then the circuit can support. You can check this by going to the panel and looking at the number on the breaker. This number indicates the maximum amperage for the circuit. Generally 10A, 15A, and 20A. Generally in home environments your major appliances are given their own dedicated circuit and then the rooms are split up in to 10A or 15A circuits that handle all the standard outlets in a room/area. If the breaker continues to trip or if you need to upgrade your current breaker panel then give us a call for more information along with a free quote based on your personal needs.